It is also our SUPER SLIM Monitor. 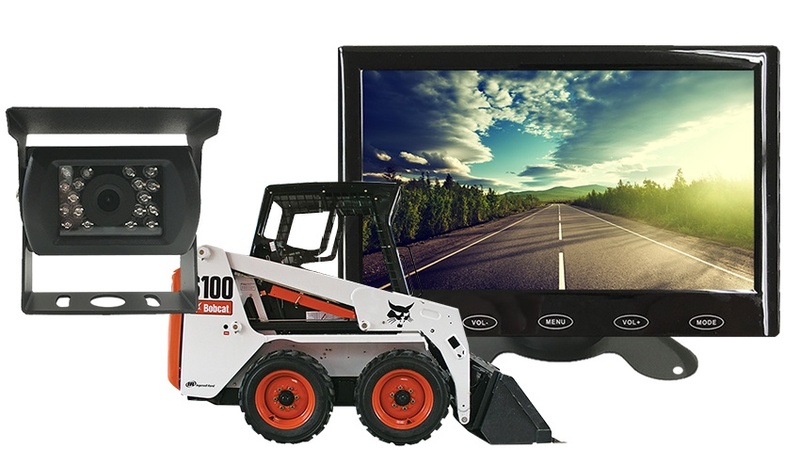 This means its extra slim and will easily fit in the cab without taking up much space at all. The commercial Box camera Has a 120° Degree viewable angle, its waterproof and has auto night vision. The camera is one of the most durable we have, with incredible adjustability and night vision clarity. The RV Box camera has a metal sun shield visor to protect you from glare and pebbles. This camera can take a direct hit from a rock and it will still work like new. Its has also been very popular with Bobcats. You can mount this camera at the top of the cage or at the rear of the vehicle. "This is EXACTLY what I wanted. I needed something to use while driving down the road and merging. I CANNOT see anything behind me at all. I like it for reverse but LOVE it for driving. Thanks guys." "I needed more than 1 camera for my RV. I wanted one for the gooseneck and I wanted to see my tow vehicle and the road. I called in and they made the perfect system for me. I love the color and nightvision on this cam."